September is the month of late harvest. Those who preserve garden fruits and vegetables have proudly counted Ball jars and bags of frozen goodies before storing them to enjoy this winter. My Canadian blogger friend, Linda Hoye, finds joy in the process and has made an art form of photographing her rich store of nutrition. On her website August 22 she tallied all the edibles she’s canned. Click on the link to see what’s inside those 288 jars along with a list of freezer delights and a dehydrator that hummed with banana chips, cherries, and raspberries. Linda is carrying on a tradition very much like my mother, grandmother, and generations before her. Here my jubilant Grandma Longenecker exclaims, “All the lids on our Ball jars have sealed with a ‘Pop'” as my mother looks on. Do share your memories of the canning process – pride, joy, the arduous work – even mishaps are welcome here around the kitchen table. Do you still preserve garden food for the winter? We’re all ears! Good morning, Marian! I love the photos–especially the one of your smiling grandmother! I also like how you use canning as way to connect time and space through generations of women who have preserved food in your family and also through blogger friends. It’s not something I have much experience with. I did can strawberry jam a few times after picking strawberries, and I’ve also made freezer jam. I’ve frozen fresh produce from the summer, but that’s about it. I learned recently that my mother’s grandmother’s house in Philadelphia had a space where they stored pickles, among other things. I’m assuming she made them, but I’ll have to find out more. Good morning to you too, Merril. Ever the researcher, you will probably follow your curiosity to your great-great grand-mother’s storage space, perhaps an arch cellar. We are curious to know what you discover – in time of course. I think you are busy with a serious project now. Thanks for being once again our first responder! What a happy photo of your Mum Marian looking proudly on the fruits of her labour! A somewhat nostalgic one of her saying farewell to the containers, but to filled yet again. This is a skill I’ve never tried, though I’ve been the recipient of gifts of homemade jams and sauces and testify that nothing on the shelves of shops comes anywhere near the homemade produce. 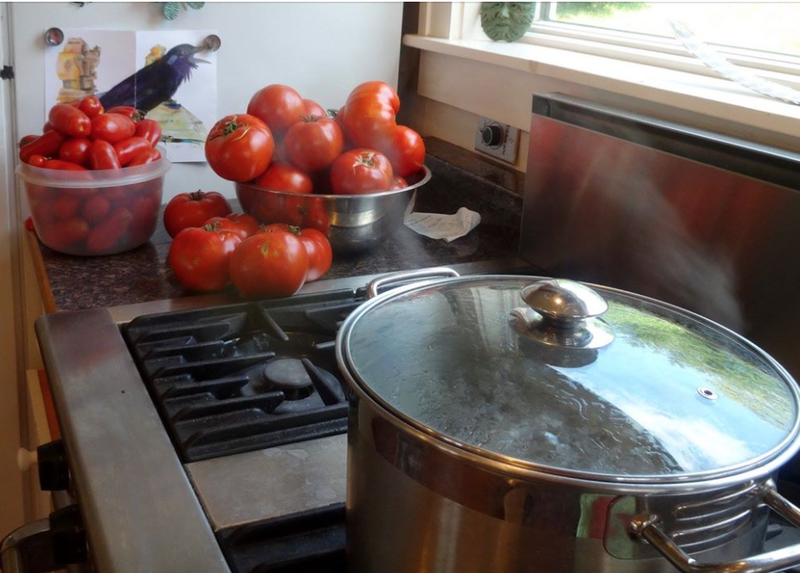 I’ve checked out Elaine’s recipes for tomato sauce – o my stars! Going on 2 pm here-presumably you’ve been up with the sparrows. Sorry I mixed up yr grandma with your mum Marian. Yes, I follow Elaine’s wonderful posts. I enjoy all the comments too and enjoy seeing you there too. Aw…what a sweet photo of your grandmother, Marian. Her smile lights up her entire face, doesn’t it? I remember my mother would go strawberry picking and then make jars and jars of preserves. I struggled to find the proper work for Grandma’s expression: jubilant, gleeful . . . She had a happy disposition, was never in a hurry, and spoke well of other people – “not a mean bone in her body”! Like me, you can probably summon the warm, sweet aroma of strawberry jam in the making. Thanks, Jill. Your grandmother could light up a room with that smile Marian. About the only thing I’ve ever bottled has been pickled onions and beetroot. I can remember though collecting fruit in a little basket for my grandmother to cook in her jam pan ready to bottle. I was first in the queue when the jam was eventually opened. To you, the massive hugger: The photo shows only her expansive smile. She never got through a conversation without laughing, often with knee slapping too. If I have any sense of humor, I’d attribute it to her. Onions and beetroot sounds heathy, but I would have guessed you have a sweet tooth, David. Thanks for the memory of your grandmother’s canning here too. Linda Hoye has quite a list: canned crab?? I never heard of such a thing. My list this year is lighter, partly because we were gone at critical times and also my shelves still have plenty from last year (for feeding just two people). Then there are the pole beans, which for two years in a row have been overcome late season by bean beetles, yielding us exactly two messes to eat each year, but none worth canning. These are my husband’s pride and joy and we worked WAY too hard for two messes. We’ll see what happens next year!! I’m ready for them to be off my list, and while I can appreciate your mother’s nostalgia saying good bye to the canning jars she had to pass on, I’m never sad to say goodbye to canning season. Can’t wait to move my canner to the basement for another year. You have had a super busy summer, Melodie, and I can certainly understand your relief at moving the canner to the basement. Linda admits she has lots of free time to do as she pleases now what she is retired. Mother’s huge canner with a big dial on the lid is waiting pickup. Not sure who will eventually “inherit” it. With other things on the front burner, I have no interest, and now no space for a garden. There are tears in my eyes reading this beautiful essay, Marian. I hope all your readers click to read the full essay in The Mennonite. Your writing is moving from good to great, as, through sensory detail, you evoke many memories, awakening longings. There are many paths to jubilacion, picturing you now in various poses at the abbey – kneeling, walking, thinking, writing. Thanks for pausing to post here. I totally forgot I did that! But delighted that you are now connected with The Mennonite as a writer. On to the Mennonite. Also this is an experiment, because I couldn’t comment on someone else’s comment at Susan Scott’s website and want to make sure it isn’t my settings, but just one of those random computer glitches I can ignore. Thanks for being in my experiment, Shirley. Canning fruits and vegetables was a huge part of my growing up on the farm. I recall as a child, picking saskatoon berries and chokecherries, washing them, removing the stones from the chokecherries and then making jam and syrup. It was so much work, done usually in the hottest part of summer, but the reward at the end was worth it. Mom canned everything, even cooked chicken. And we mustn´t forget those delicious dill pickles, the like of which I have never tasted since. When unexpected company came, we just went into the cellar, brought up a few canned items, sliced some dills and a fabulous meal was served. I did can a few things like tomatoes when I was first married but soon got too busy with my job, children and city life. Now I am craving fresh baked bread and chokecherry jam! That’s the reward for canning in the hot, sweaty months. When the cellar was cold, I remember bringing up cans of tomato sauce and green beens. Mom added macaroni and hamburger and that was dinner. I’m glad this post evoked so many fond memories. I just read your article in The Mennonite magazine. It is excellent. I can so relate as my great-grandmothers, my grandmother and my mother definitely equated food with love. In some ways, I think I still do too. Very well written article evoking fond memories. As I recall, you have a “plain” background too. Maybe not Mennonite, but certainly with firmly ingrained traditions, including love for the soil. Thank you, Darlene! Yes, our background is very similar! Just loved the article, Marian–such rich sensory memories of precious time spent with your Grandma LongeneckerLongenecker. The photographs here are wonderful too! 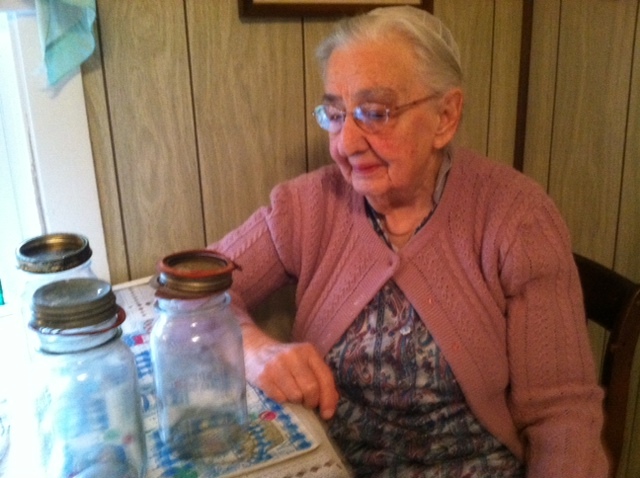 So much joy in the face of your grandmother and the, perhaps bittersweet, look on your mother’s face as she bids farewell to her canning jars. Joy found in simple things. Priceless. Thank you for including a link to my blog too. You’re welcome, Linda. Your photos are exquisite and reveal a woman who works hard behind the camera and in her kitchen. I’m happy to direct others here to your treasure trove of goodies. We are all impressed by your canning/preserving numbers. Even if snowbanks reach the roof, you’ll never run out of food. Ha! What a great post. Just the other day I was talking about moms canned pickles; they are the best. I was going to call Jean to ask her if she cans mom’s pickles. I would love to have them again. I was surprised that a young mother in our church cans. I told her about mom and times that I watched mom can. I should have taken the time to learn. Beautiful pictures and memories. Thank you for keeping it alive. Gloria, you can picture both kitchens (Mom’s and Grandma’s) with the canning business going on. Mom’s canner is still at Ruthie’s house if you want it! Thanks for stopping by with a comment here. Yes I have to get there. Everytime I make plans something comes up. I do want it to learn to can. Teach my family. Is there a recipe for moms pickles. I think someone in the family has the recipe, if not my sisters, then one of my cousins. Thanks for reminding me. I’ll have to check on this! You have stirred wonderful memories of pickled peaches from the trees in our yard. There was soup mix, jams and jellies, green beans, tomatoes. The colors were varied and beautiful, as all the jars lined up on the shelf after writing the date on each one. I can smell those peaches. My Mom was a many talented wonder whose hands were always busy. We are blessed to have such sweet memories of home. I’m always thrilled when readers like you say they’ve been stirred to reminisce. I’ll bet you can see, smell, and taste some of those kitchen wonders even now. 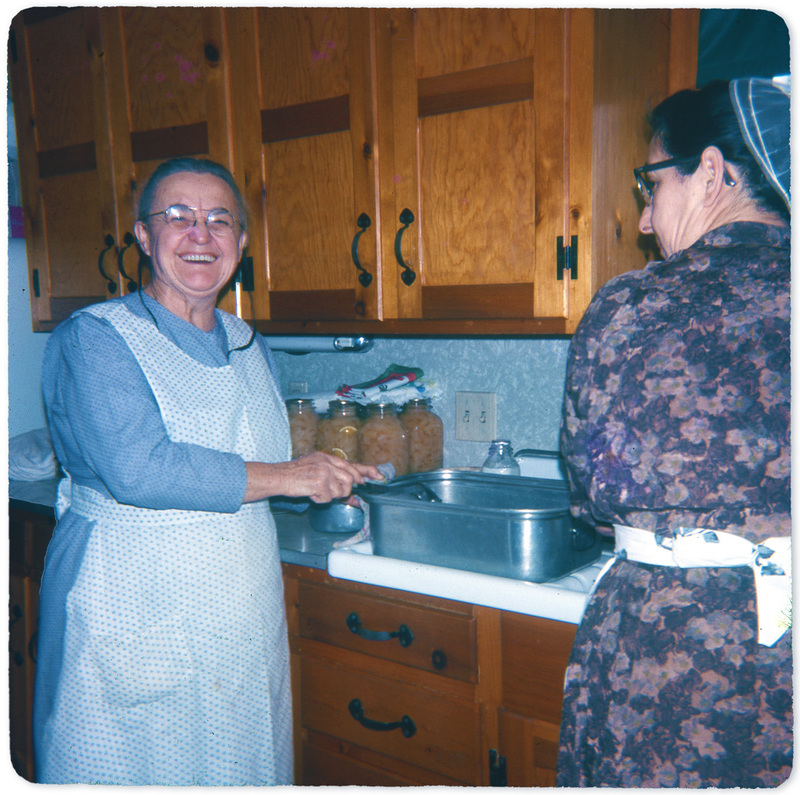 Our mothers’ kitchens were altars of blessed sacrifice. In or out of the kitchen, you are a reflection of your mother, I’m sure. Oh my goodness, Marian, I loved reading your article in the Sept 2016, Food and Faith issue of The Mennonite. The is so COOOOOOL! And in this post, the smile on your Grandma Longenecker’s face is absolutely contagious! Have I canned? Yes. Once. With my maternal grandmother. Did it turn out? Not even close. Bottom line on top: we were scraping split pea soup of MY kitchen ceiling and walls for what seemed years. Grandma was “teaching” me how to use a pressure cooker. The incredibly important step she forgot to impart was adding water to the pressure cooker itself. Yes. Pressure cookers really can explode! You made me laugh – more like a guffaw. I think I had a pressure cooker experience once too, with tomatoes. So my explosion was red, not green. Either way, the clean-up is a boring chore to say the least. Yet, they’re memorable: no one remembers the experiences that turn out just right, now do they – ha! Thank you for taking time to read the article – so appreciated, Laurie. Yes, Marian, so many memories of your Mother Ruth and Grandmother Fannie. My mother, Anna Ruth, was good friends with your Mother. And yes, I have a huge family garden and, yes, we still freeze corn and green beans and can tomatoes, spaghetti sauce, salsa and pickled beets. Applesauce without sugar and pears with a little. Grape juice from Concord grapes. So thankful for good food, without any sprays to contaminate. When someone asks if I exercise, I just say, yes, I am a gardener. Whoops, I am writing to an English teacher. Not all sentences are complete!! Your sentences are perfect, especially as they describe your preserving with all the colors of the rainbow represented. We all know too that family canning projects preserve more than food. Yours sound like a fabulous family bonding experience. It so nice to see you here, Ava Lee. Thank you! I think some of my readers may be envious of your plentiful pantry. I am thrilled with your article in the Mennonite. I hear our teacher’s voice urging out the sensory details and wow does everything come alive. Oh, Dolores, so “Nice” to see you here, recalling our days together with “Brother Ben” – ha! Yes, how I remember his commands, firmly spoken. Actually, I think I do respond better to a stern voice than to quiet suggestions. I wonder how you are doing with your own writing. When I visited the Mennonite Historical Society in Lancaster and posted on Facebook, I believe you remarked about having a membership for research. Thanks for reading and commenting here – so heartening! Writing…still researching and absorbing details and trying to be patient. I get it, Dolores. My inner critic is alive and well – even beats a drum to let me know I should catch up to it – whatever “it” is. What’s the saying? “No wine before its time.” Let’s go with that! Delicious post, Marian!!! My mother, my aunts and my grandmother all had walls of canned goods and freezers filled deep with frozen breads and fruits, and the love of their labors was shared with our families–and with anyone needing some help–all through the winter. I love the connection to babies here. An expression “I could eat you with a spoon!” links with your cuddling comments. Babies just smile and coo. When they become teens, they gag. That where my grands are now. I can’t get away with much affection nowadays. “Walls of canned goods and freezers filled deep” is of course how I’d imagine the womenfolk in your family would operate. I feel the warmth here, Marylin. Hope you are doing well – mama too! Thanks, Marian. I go back to Kansas next week for my regular visit, but en route to see my mom, I’ll be with my granddaughter for an outpatient removal of a growth on her upper back. Her mom is meeting with 5 sets of Spec Ed parents to finalize IEPs, so Mor Mor will be Grace’s ally for the procedure. She’s 13 and not big on showing a lot of affection, but it comes through when she calls and says, “I really need you, Mor Mor. And then maybe we could go out for a late lunch, okay?” Ah, what would we do without all these generational female support systems? Thanks for sharing this special need. I will join in prayer for a successful procedure, for the doctors and specialists involved, for traveling mercies and most of all for family ties strengthening. Especially that! Thank you, thank you, Marian. I just received the surprise, Marian. I used to can and freeze like that, but haven’t since my kids grew up. Every years I packed a huge chest freezer with all the vegetables for the winter and 8 or 10 loaves of homemade bread (I baked lots at once). Then, on the shelves Vic made of old barn boards, there were canning jars filled with tomatoes, tomato sauce, cherries, peaches, apricots, plums, applesauce, and pears. The apples and pears were from old unsprayed orchards. To be truthful, I loved the colors as much as anything and I’m sorry I wasn’t taking many photos when the cellar was filled with that bounty. (Did I mention the bushels of carrots and onions that lasted until spring? Vic sometimes made apple juice when our old apple tree had a good year. The photo that moved me the most was your mom saying goodbye to her canning jars. I’ve given most of mine away, many to my daughter-in-law. If you want to experiment with this topic, your readers would slurp up chapters in your book on organic gardening. Based on comments here and on Facebook, canning/freezing are becoming lost arts, the topic of reminiscence – not reality. I see colors too when I think of canned goods on shelves, remembering how pretty Mom’s looked but connecting them to eating, not art. Is you tomato sauce recipe online? Fresh tastes appeal to me too. Thanks for an appetizing commentary here. I’m glad I’m having lunch with a friend; otherwise, I’ d have to raid the fridge right now. Oops! I see the link replying to Susan’s comment above. Got it – have printed it out too. Thanks, Elaine. It’s so important to maintain those healthy traditions! I believe that kind of thing does help bring families together and then there is the gift of sharing with friends and neigjbours and school fêtes too, all made with care and love. We used to make apple, pear and p!umb chutney, but our plum tree died years ago and we never replaced it. We still eat and bake with the app!es and pears, though! We went blackberry picking at the weekend and made a lovely apple and blackberry crumble: you just can’t beat the quality of home made goods. I love the thumbnail photo of your mobile home and the mountains in the background. We’ve had our noses to the grindstone moving. The idea of escaping on a trip seems really appealing to us now. Blackberries are my husband’s favorite. We don’t have any locally, but your comment reminded me I still have a bag of blueberries in the freezer from last June. I should get them out and make pancakes as a surprise. Thanks for sparking an idea for me here. Thank you, Marian. I am glad you like the picture; it was taken crossing the Pyrenees from Spain back into France: absolutely stunning views! I expect I will be blogging about it in a couple of weeks. I think we saw the Pyrenees from the Italian side if that’s possible. They seem to rise up from flat land and touch the sky. What beautiful views you have – a healthy lifestyle too! I don’t think you can see the Pyrenees from Italy, as the make a natural frontier between France and Spain. What you saw were probably the Alpes, between France, Italy, Switzerland and Austria, also amazing. In Italy they take the name of Dolomites. Making love edible – such a wonderful thought! We are quite a pair: you always make nature beautiful; I show how Grandma L. made love edible. I’m glad the thought made you happy! I am useless at growing things in the garden and yet my dad grew just about everything there was to grow . He was still growing delicious tomatoes in his 80s but never passed down his talents to me . Maybe as a child I didn’t show any interest …who knows . I am a great one for pickles and I used to make pickled red cabbage and pickled onions . Haven’t done it for a while I must get the jars out again 😊. I do read Linda ‘ s blog she is amazing isn’t she … I love her photography . That little sweet look on your mum’s face when she decided to give up her jars …😔Bless her . I liked pickled things too, and they’re healthy because of the vinegar. In fact, I have a pickled egg (soaked in beet brine) every morning. Thanks for always sharing your cheery bits here, always a happy “read” Cherry. What a sweet post with wonderful photos. Made me nostalgic for times gone past. However, I’ve never canned! (that sounds weird). In my household, my mom bought cans of green beans or peas or other vegetables while I was growing up, so I always thought I hated vegetables. Wasn’t until I moved to CA in my early 30s and bought FRESH veggies every day that I discovered I LOVE vegetables. Now, I’d prefer them on my plate to anything else. BUT, I still don’t ‘can.’ My husband’s garden has produced beautiful eggplants and Brussel sprouts and tomatoes and zucchini, but just enough to eat them, enjoy them, and none left over. However, I love getting ‘canned’ gifts from those much more talented than I am in their garden and then their kitchen. Even better than canned – fresh produce from the garden. I assume you said “My husband’s garden” because he plants, weeds, and harvests. You both eat! Nice arrangement I’d say, Pamela. I just bought Brussel sprouts. Now you’ve made me want to search for the online recipe I saw online not long ago. Easy-peasy – just right for writers who don’t want to spend too much time in the kitchen. I’m of the same school as my mother. I just throw things together and hope they taste good. Usually they do. Blogging and cooking have some similarities, Marie. I haven’t sampled your food, but if it’s like your blog posts, there’s more planning than what meets the eye. Thanks for stopping by here today! I just finished poking around in your website and following you on Twitter, Tina. Thanks for following my blog and commenting here. I see you have Pennsylvania roots and enjoy the culinary arts of the Amish and Mennonites. If we were both in PA, I would take you to Root’s Country Market and we’d share an honest-to-goodness shoofly pie. Thanks again for connecting here with a comment too. It appears we have a mutual friend in Sally Cronin. I look forward to getting to know you better, Tina!